Boccaccio's De casibus virorum illustrium in the French translation by Laurent de Premierfait. 372 x 260 mm. – 509 leaves. With 5 (of 9) large miniatures with full borders. Boccaccio, the great Italian poet and prominent humanist, originally composed this collection of stories between 1355-1360. Conceived as a true encyclopaedia of historical biography, it deals with the fortunes and calamities of famous people starting with the biblical Adam, continuing with mythological and historical figures from Antiquity, and concluding with several of Boccaccio's own 14th-century Florentine contemporaries. The work was translated into French by Laurent de Premierfait (c. 1380-1418), a skilled poet who was renowned as the translator of texts by Livy, Boccaccio and Cicero. 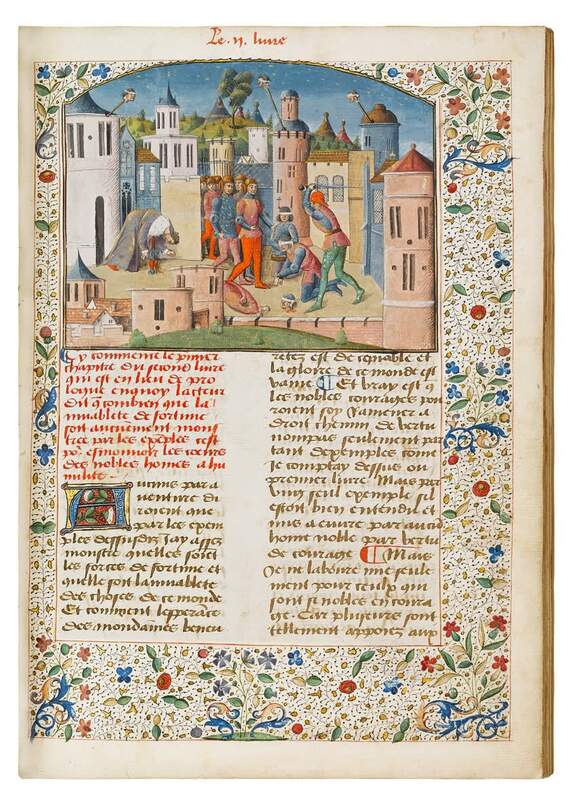 This manuscript is a notable addition to the Parisian luxury books associated with artist commonly published under the name of Maître François. There were several artists in the circle of Maître François and their oeuvres are as of yet not fully documented. Recent research has identified the Maître François and the chief associate of his workshop as a father and son team named François le Barbier père and fils.